The shape, size, and proportion of individual teeth can be as important to how your smile looks as a bright, white shine. If you live in or around Rochester and you're unhappy with the appearance of one or more of your teeth, cosmetic dentists Dr. Paul Sussman and Dr. Meredith Pogal can determine whether or not you're a candidate for porcelain veneers. 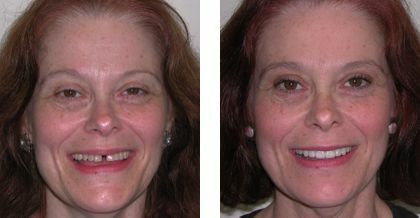 Porcelain veneers have a variety of different aesthetic applications. Please call Drs. Pogal and Sussman today at 585-227-4390 to schedule a free consultation to learn more. We are pleased to see patients throughout the Rochester area. Veneers are made from dental porcelain, a very sturdy ceramic material. The porcelain is handcrafted into a shell shape that conceals the front of the tooth, restoring both natural color and aesthetic attractiveness to your smile. Along with these aesthetic issues, your teeth and gums should be in good health. Veneers require some removal of existing enamel, so your teeth need to have sufficient structure to support the ceramic shells. Our dentists offer premium porcelain veneers including Empress, Aurum, and Feldspathic. However, many patients ask us about Lumineers®, a popular brand renowned for its ultra-thin design and limited preparation requirements. Dr. Sussman and Dr. Pogal can discuss which veneer will best fit your smile during a free consultation. Though it is often an effective treatment option in itself, porcelain veneers are also a popular component in comprehensive smile makeovers. Our cosmetic dentists can help you determine how veneers might fit into your custom treatment plan. If you're interested in enhancing your smile, please contact the office of Dr. Paul Sussman and Dr. Meredith Pogal or call 585-227-4390 today to schedule your free consultation. Our cosmetic dentists serve patients in communities in and around Rochester, including Greece, Brockport, Fairport, Webster, and more. How Can Lumineers® Help Me? Lumineers® are much thinner than conventional porcelain veneers – about the same thickness as a contact lens. This ultra-thin shape allows our dentists to fit Lumineers® to your teeth without extensive removal of enamel. If you're unhappy with your new look, Lumineers® are removable. To find out if Lumineers® are right for you, please contact Drs. Sussman and Pogal or call 585-227-4390 today. Free consultation for patients in and around Greece, NY.